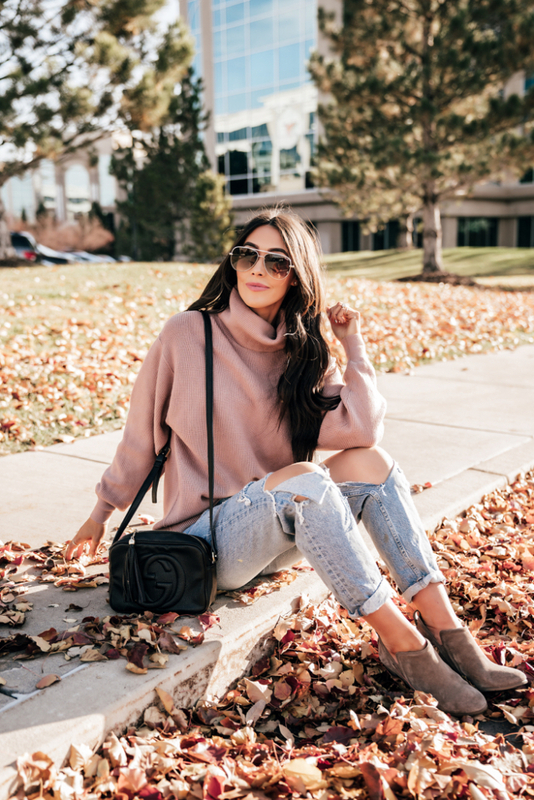 I’m loving every second of this beautiful fall sweater weather and am so excited to share some of my favorite fall fashion trends! Distressed jeans are such a fun trend right now. I feel like you can really make a statement with them and make them the main focus of any outfit. For me, I love them because they’re super comfortable to wear and are super cute. I have been wearing this pair on repeat lately. 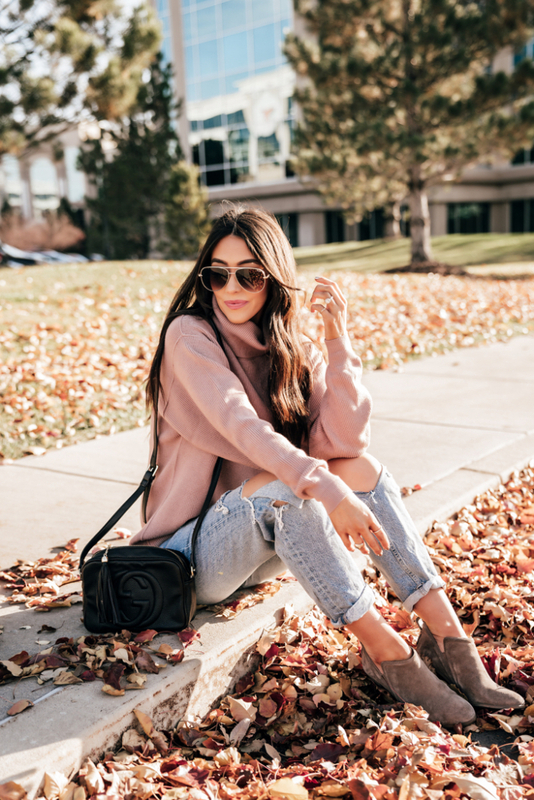 I feel like these jeans are great for fall because it’s not super cold yet, so you can get away with showing a little skin and not being too cold. I bought this pair from Nordstrom. They have some of the cutest distressed jeans right now! Can you really have enough sweaters for fall? I wouldn’t say I’m picky about my sweater choices but I certainly don’t settle for anything less than the coziest of sweaters. I really love the oversized style. Especially with my little bump growing, it’s nice to not always wear form-fitting pieces. Especially for fall when I’m needing a little more warmth! I feel like you can make such a statement with a chunky sweater. I love this soft pink/mauve color of this sweater. It’s so soft and flirty. Give me all the booties in the world! Especially super comfortable ones that can be worn all day. Yes, these shoes are seriously a mom game changer! I don’t always want to wear flat shoes. I find myself wearing tons of booties through fall and winter. I love having a small heel, I feel like it’s super flattering especially when I’m wearing bigger pants. I love booties because you can seriously wear them with just about anything! Leggins, dresses, jeans, and jumpers work perfectly with booties. I love being able to find some of my favorite bootie styles at Nordstrom. They have some of the cutest styles that are perfect for fall and winter. Oh man, have I found a passion for accessories lately! I seriously have tried to ramp it up in the accessory department. And lately, I’ve been loving belts. I think belts make such a statement with outfits. I tend to tuck most of my shirts into my pants and sometimes I feel like my outfit is missing something to really finish it off. I’ve also loved shoulder bags. I tend to wear a lot of large oversized bags which are great but it’s been nice to size down my bag, especially with all the added layers fall brings. I’d say accessorize for the fall! There are so many fun ways to do it! Hats, scarves, belts, you name it. Thank you SO much to Nordstrom for sponsoring this post. All thoughts and opinion are my own.